Classic Physique Builder: So What is a Zeller Curl? Welcome to the world of Classic Physique Builder! 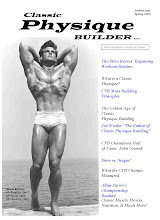 Find information and inspiration from the steroid-free, Golden Age of Classic Physique Building to help you build a muscular, powerful, symmetrical, healthy, and attractive physique. So What is a Zeller Curl? In our last post, we gave you Marvin Eder's favorite arm routine for breaking through "ruts." One of the exercises he recommends is the "Zeller Curl." These days, most bodybuilders probably don't know what a "Zeller Curl" is. So here is some background. This curl is named after Art Zeller - the famous physique photographer - who in his early years, was a classic physique builder (i.e., a bodybuilder before the advent of steroids) who popularized this curl. "Zeller Curl. This curl is named after Artie Zeller who popularized it some years back, and is now widely used by New York City bodybuilders. Take a heavy dumbbell, heavier than you can curl to the shoulder in good form, and swing this weight to the shoulder. Hold the elbow against the side, on the hip if possible. Now, lower the weight, leaning back while doing so, fighting the downward movement of the weight every inch of the way. When it is down all the way, swing it up to the shoulder again and repeat... It may take a little practice to master this movement, but since Marvin feels that it is one of the very best, it will be worth a little special attention." The mission of Classic Physique Builder (CPB Blog and CPBzine) is to: (1) promote the ideal of developing a classic physique, (2) demonstrate what kind of body can be developed naturally,(3) preserve & learn from the history of the pre-roid Golden Age of Classic Physique Building, (4) serve as a source of education & inspiration to all; and (5) help initiate a Renaissance of Classic Physique Building in the 21st Century! Subscribe To CPB Blog Posts! 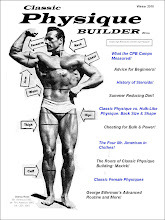 For a free 1 year subscription to Classic Physique Builder (CPBzine) - a pdf zine patterned after the muscle mags of the pre-roid, Golden Age of Bodybuilding (the 1940s and 50s) - just send your name, the name of your city (not your address), state/province, & country to cpbzine@gmail.com. That's it! CPBzine is published quarterly (Spring, Summer, Fall, and Winter issues). CPBzine Back Issues - Now Available! 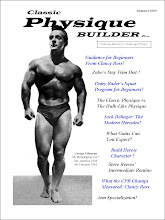 Back issues of Classic Physique Builder Zine (CPBzine) are available to all CPB Donors as a "thank you gift" for supporting our mission. For a $5 donation (USD), we will send you the back issue of your choice. For a $10 donation (USD), we will send you up to 3 back issues of your choosing. Simply click on the "donation" button below and then follow the paypal instructions. Once you have made your donation, then send an email to us at cpbzine@gmail.com and let us know which back issue(s) you would like. You will then receive your back issue(s) in pdf format via email. It's that easy! Support The CPB Mission Through Your Donations! Hi and Welcome to CPB! I'm Anthony Miller - a PhD in anatomy & cell biology, researcher, scientist, academician, pre-roid Golden Age aficionado, and aspiring classic physique builder. I founded CPB because I got tired of waiting for someone else to do it! For those of us who have no intention of using drugs to build our physiques, it is nearly impossible to get good, muscle-building info that works for non-drug users or inspiring images of classic physique champs from the extreme, steroid-oriented muscle mags of today. 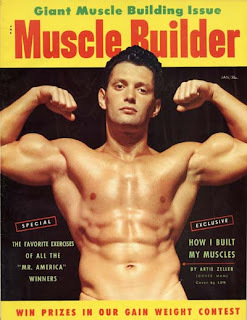 Fortunately, there is a vast wealth of pre-roid, Golden Age information from the 1940s and 50s that we can use to build Golden Age physiques that are drug-free, healthy, muscular, powerful, symmetrical, and attractive! 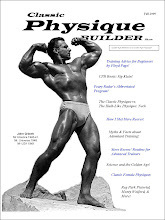 It is the mission of Classic Physique Builder (CPB Blog and CPBzine) to make pre-roid, Golden Age bodybuilding information available again to all, so that we are no longer held captive to the extremism of the modern muscle mags and so that a new, 21st Century Renaissance of Classic Physique Building can arise! If our mission appeals to you, then please join us in spreading the CPB Movement wherever you are and in whatever way you can. Help us get the word out to people that Golden Age Classic Physique Building (true, pre-roid bodybuilding) is a better and brighter alternative than what the current, mainstream, drug-based bodybuilding world provides! Please consider supporting the CPB mission through your donations (see donation button above). This will allow us to continue to offer CPBzine free for those (especially young people) who truly cannot afford it. - Thank you! Recommended Sites & Mutual "Friends"